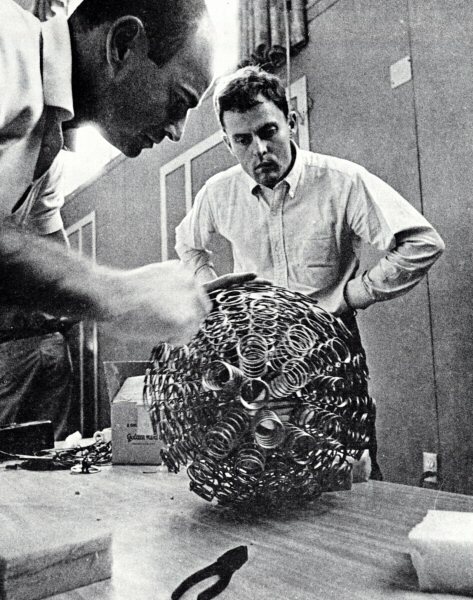 Peter Hirsh and Öyvind Fahlström with ball designed to carry bouncing sound. Photo William Rivelli. 9 Evenings: Theatre and Engineering, Pontus Hultén and Frank Königsberg eds. ([New York]: Experiments in Art and Technology: The Foundation for Contemporary Performance Arts, ). In 1961, the Swedish painter, poet and dramatist Öyvind Fahlström arrived in New York and began associating with the artists connected with Happening and Judson Dance Theater.